Carter Dickson, the principal pseudonym of John Dickson Carr, whose Wikipedia entry is found here. The Dickson pseudonym was reserved primarily for the adventures of Sir Henry Merrivale, of which this is one. 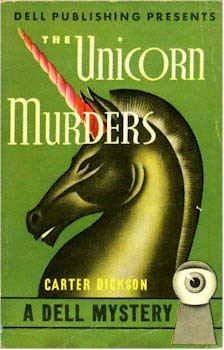 John Dickson Carr, in all his pseudonymous incarnations, is still the “Master of the Locked Room Mystery”; this particular volume qualifies only as a subset of the locked room mystery, an “impossible crime”. This 1943 volume qualifies as a Golden Age mystery; second under “G”, “Read one book set anywhere except the U.S. or England.” This book is set in France. For a chart outlining my progress, see the end of this post. 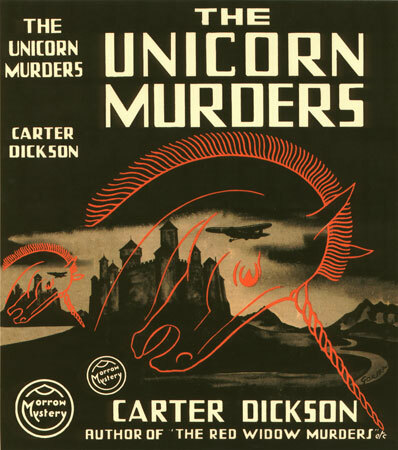 The first edition is from William Morrow (U.S.) and a scan of the jacket can be found below. My own copy is Dell mapback #16 (1940), unnumbered except on the spine. Many other editions exist; the book has been occasionally reprinted in paperback (Berkley Medallion, 1964; IPL, 1989; Black Dagger, 2000) and there is a 1944 digest-sized edition from American Mercury #52. Standard spoiler warning: What you are about to read is likely to discuss in explicit terms the details of a murder mystery. Please read no further if you wish to preserve your ignorance of the plot. I have elected here to not reveal the murderer but it is likely that you will find out more than you wish to know, if you haven’t read this book. The protagonist, Kenwood (Ken) Blake, is an agent of the British Secret Service who works for the brilliant and eccentric detective Sir Henry Merrivale; Blake is a recurring character in a few books and is the usual doofus, in charge of the narration because he’s two steps behind the detective and one step behind the reader. He’s in love with his fellow agent, Evelyn Cheyne; together they are in France and become entangled in a bizarre battle of wits between Gaston Gasquet of the Sûreté and his arch-enemy, Flamande. And in a twist that strikes anticipatory delight into the heart of the reader, no one knows what either Gasquet or Flamande looks like, and they are both “masters of disguise”. Sir Henry, Blake and Cheyne are part of a group of passengers — almost certainly including both Gasquet and Flamande, or what’s the point? — whose plane is forced down near a chateau whose master, the Comte d’Andrieu, welcomes them all. Everyone goes to rooms on the second floor to change. The driving rain promptly brings down the causeway that is the only access to the chateau; the connoisseur immediately recognizes the standard country-house situation. The only possible murderers and victims are now isolated in the chateau and the game is afoot. Almost immediately, one of the passengers tumbles down the stairs to the ground floor, in full view of witnesses, with a hole in his forehead that looks like it was made by the horn of a unicorn. But no one was near him at the time. Now, this is rousing stuff, and the story moves forward at a brisk clip until the climax. In fact, the events are dizzyingly difficult to follow; there are so many people who are not what they seem that it’s the rule rather than the exception, and disguise plays a huge role in this plot. Indeed, it is incredibly difficult to solve this mystery, and the average reader may as well sit back and merely enjoy the ride. If you’d care to match your wits against the brilliant JDC in one of his most difficult works, you will need to keep very careful track of exactly who is where at all times — regardless of what they say, or what you’re told. And you will have to figure out exactly what happened in the minute before the corpse arrived at the bottom of the staircase. I’ve chosen to say very little about what goes on in this novel because it really is worth reading; the answer depends on coincidence, dim lighting, split-second timing and the development of a complicated scheme in a very brief period of time, in an unfamiliar location, but it is absolutely fair. You are given all the clues you need to solve the mystery. One excellent reason to get the mapback edition is that, with this book, you will actually find the map useful; this book requires the reader to form a picture of the building, its furnishings, the location of its inhabitants, etc., in order to have any chance of solving the mystery. For the connoisseur of the fair-play puzzle mystery, and its most rarefied levels exemplified by the impossible crime story, this is an absolute classic. It’s one of Carr’s top ten, in my humble opinion. The difference for me is that I expect most readers to slap their foreheads and say, “Oh, I should have figured that out!” instead of “Oh, who the HELL could have figured that out?” The first is pleasurable and the second is not. This book is very pleasurable; it’s exciting, fast-moving, filled with unexpected twists and turns and with a solution that will knock you back in your chair. Of course, it’s well known that Carr was not much on characterization, and this book is no exception. The two agents whose love story underlies the plot are bland cyphers whose love interest is inexplicable, except you sort of have to have one, Carr seems to feel. Sir Henry himself is mostly a collection of annoying mannerisms and verbal tics whose main function is to hide his deductions from the reader until the end. Since all the characters must have an equal chance of being the guilty party, there’s not much to any of them; the backstories are implausible and the events of the plot have obviously been jiggered to pack as many of them into the isolated chateau as possible. In fact it’s pretty clear that Carr worked out the method of murder and then wrote a book around it. But unless you are the most cold-hearted of readers, you will be amused and pleased by this book. True, it has little in the way of what I think of as “literary quality”. This is not art fiction, this is melodrama with a complex puzzle at its heart. But it is damn good melodrama written by a master of that genre. Some cold-hearted readers may say that the solution is implausible; I agree. It is implausible in the extreme. But such concatenations of implausibility do occasionally happen; those cold-hearted readers at least cannot say that they haven’t been given every piece of information and inference needed to solve the mystery. This is one of a very small group of mysteries that really is worth trying to solve. Carr seems to have felt that this sort of novel is a kind of battle between the reader and the writer, and if you want to have a chance of winning, I recommend that you take it very, very slowly — know where everyone is and what they’re doing — be aware that trickery and impersonation abound — and stop before the end and formally declare your opinion as to who the murderer is. There are so few of these mysteries in the canon that it is worth savouring this like some exquisite lollypop, taking only slow, careful licks until the centre is revealed. I envy the reader who has yet to read this book. Don’t spoil your experience by rushing through it. As of this writing, a VG first edition without jacket will set you back somewhere between $150 to $200. I didn’t see any copies available with jacket; that might be in the $300 or $400 range. There are a number of collectible paperback editions; principal among them is Dell mapback #16, with cover artwork by Gerald Gregg, and a Near Fine copy is available for $50. That would be my choice as the most collectible edition that will hold its value the best, since mapback collectors abound. My own copy is less pristine; it’s rolled and worn, but the colour is bright (always a problem with this particular cover, for some reason) and I think it’s worth around $20. The image at the top of this post was scavenged from the internet. 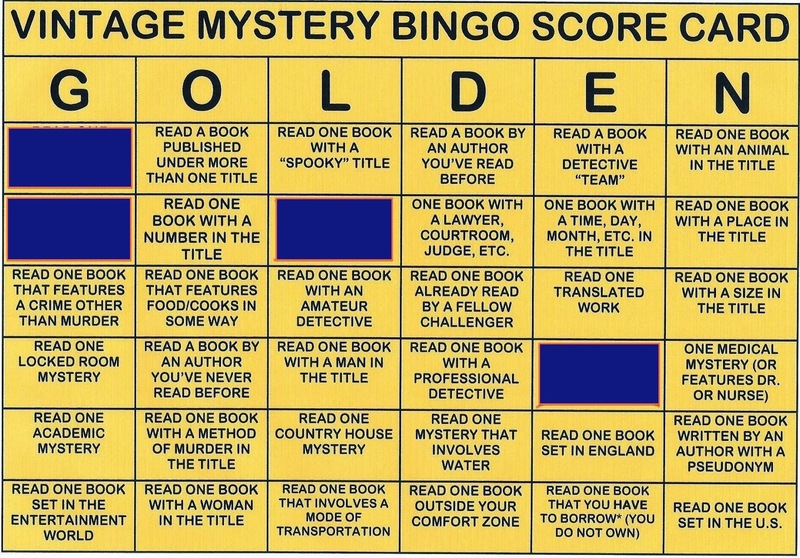 This entry was posted in 2014 Vintage Mystery Bingo, Brand, Detective fiction, Mystery, Mystery writers, Novel and tagged Carter Dickson, Gerald Gregg, John Dickson Carr, Kenwood Blake, Sir Henry Merrivale. Great review Noah – I love Carr’s books and this is a classic that deserves to be treated this well – cheers mate! Thank you, sir. I confess I was torn. Usually I like to say much, much more about a book’s plot and structure and details and … etc. But I am fond of this book and have always been willing to overlook its small flaws because I enjoy it so much; I believe others will enjoy it also. And in order to give them the experience I think they will want, I thought it best to not say too much — other than that I recommend the experience! I own an excellent copy of the Dell Mapback and I think it only set me back $7.50! I’m not sure I agree with you about the Spivak digests being collectible. I see them sit around in used bookstores for years. I know no one who collects them. They usually only get sold when the digest is the only edition available of a certain title. Plus, most of those digests are abridged books. I’d be afraid of reading an abridged detective novel for fear of missing something crucial. I liked this one a lot. Bizarre and gruesome murder method, devilish misdirection, neat thriller action sequences at the end with the airplane. I tend to prefer Merrivale in *all* of his appearances over Dr. Fell. I think i’ts his larger than life personality. Plus, I’m one of the few who find him very funny. I think that prices and availability are definitely different in Canada — not as many of them made their way up north, so they have more scarcity value. Now that eBay has rationalized the pricing structure, perhaps not so much — perhaps I overestimate prices because I live in hope of a trip to Hawaii if I ever get rid of a room full of old paperbacks LOL. I thought it was worthwhile to make a comment into my actual post to reflect your opinion of the digest editions; I’m willing to take your word for it. My experience with actual collectors of these was about 30 years ago at least. I didn’t realize that there was a mapback for this book. 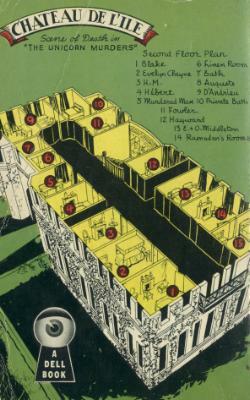 My edition came with a floor plan within the book, but it is lacking the fine details that the mapback has. I love that you appreciate the mystery in this story. I wouldn’t quite call this a Top 10 Carr book, as the whole caper aspect of it is kind of thin. I do agree that this is Top 10 if looked at from the perspective of the impossible crime and the satisfying solution. And, as you point out, the fact that this is actually solvable. As mentioned in my post on the book, I actually did solve this one (at least how the impossibility was done, but not the who). Similar to The White Priory Murders, I think this is one of the truly solvable puzzles, you just have to ignore all of the conjecture and say “what is the simplest possible thing that could have happened?” I personally love that, and I think it shows Carr as a master of the craft. We do seem to agree on this, more or less.